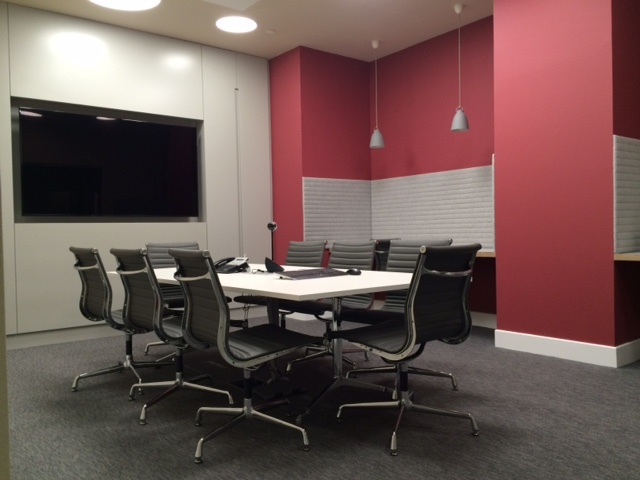 The project involved 3 meeting rooms. The largest room had a floor space area of approximately 20sqm, the second room was slightly smaller at 14.5sqm and the smallest room was approximately 9 sqm. 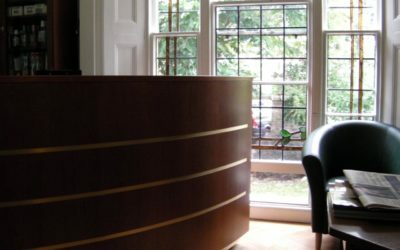 The smallest room presented the biggest problem for furniture selection since the shape was an irregular rectangle featuring a curved wall to one side and two entrances diagonally opposite each other. 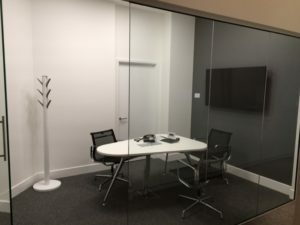 After careful analysis of the potential options and discussions with suppliers the innovative options presented by Solutions 4 Office for the smaller meeting room were the superior option to give GIA the perfect table. A pear shape meeting table made to size to fit the room and offer a flexible meeting solution for 4-6 delegates. The table allowed for integration of a built in horizontal power, data and comms module for ease of access to a number of services. These included 2 electrical power sockets, 3 USB points and 2 CAT5E networked data points. All of these were discreetly housed within the table and could be accessed at any time without the need to “scramble” under the table. 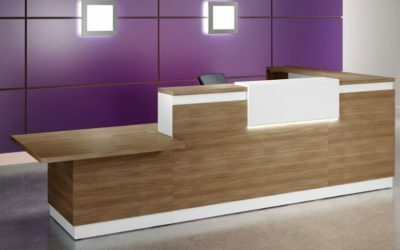 The whole design was perfect and Solutions 4 Office were commissioned to produce the table. 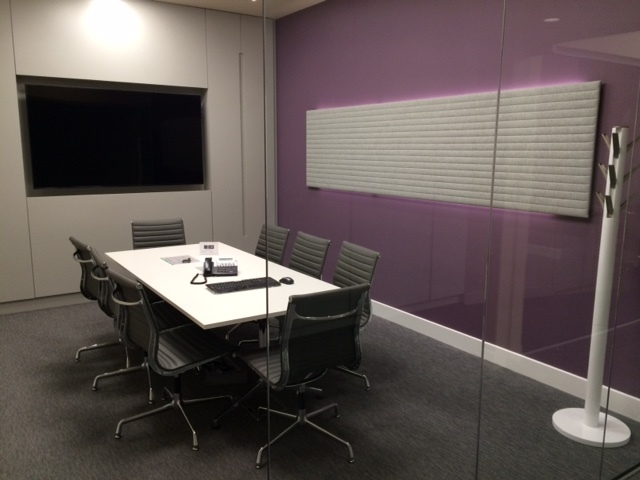 The other meeting rooms needed a more regular shape to mirror the room dimensions and style. After careful deliberations and appreciation of the design that Solutions 4 Office had undertaken for the smaller meeting room they were selected to manufacture the tables for the larger rooms as well. 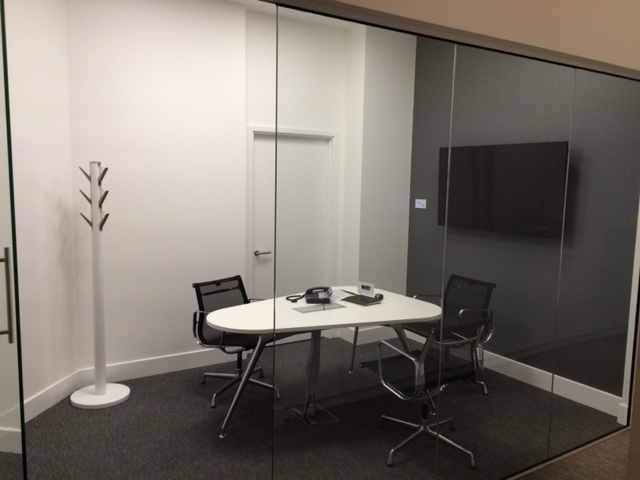 These were a 2.4×1.2m matt white top table with chrome frame incorporating polished aluminium feet; a 2.2x1m version was used in the slightly smaller meeting room. Both tables were made with single piece tops and build in electrics, data and comms. “The impressively fast lead time for these fully facility integrated tables helped GIA meet the tight completion deadline. The cleanly designed and produced tables are now successfully deployed in the 3 meeting rooms allowing high quality interactive discussions with clients to take place.